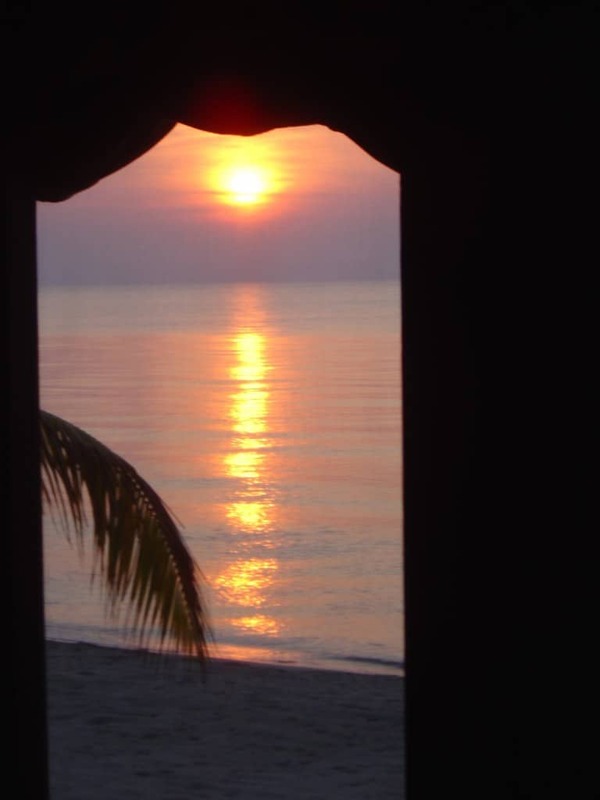 Belizeans lovingly refer to their country as “the Jewel.” Located at the southern end of the Yucatan peninsula, facing the Caribbean Sea, she borders Mexico and Guatemala. Belize is the only Central American country that does not have a border with the Pacific Ocean. Many people refer to Belize as Mother Nature’s best kept secret, and for good reason. Belize is home to the second largest barrier reef which provides shelter to hundreds of cayes (pronounced keys), mangrove swamps, jungles, wildlife reserves, the largest cave system in Central America, waterfalls and some 900 Mayan archeological sites. When visiting there you feel a sense of untouched beauty and mystery. Much of the land is still undeveloped. Belize is one of the least populated countries in the Americas, with only 35 people per square mile. The first known people to develop Belize were the Mayans, around 1500 BC. They clearly had a large presence in the country but left a lot of her land still undiscovered. Christopher Columbus reached the coast of Belize in 1502, but it was the English that set up settlements beginning in 1638, lasting for the next 150 years. Belize was known then as “British Honduras.” In 1973, the region’s name was changed from British Honduras to Belize, and on September 21, 1981, full independence was realized. The people of Belize are a true melting pot, representing more than eight diverse cultures. They are made up of Maya, Mestizo, Kriol, Garifuna, East Indian, Mennonite, Arab and Chinese. There are also many expats from Canada, Europe, and the United States that call Belize home. 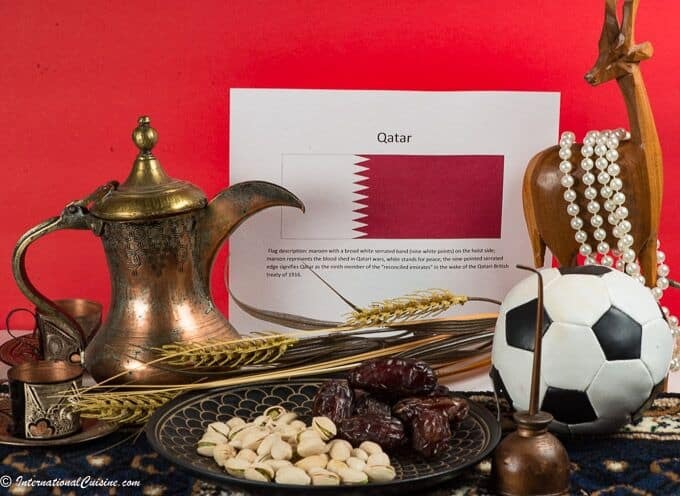 This blending of cultures has resulted in one of the happiest and most peaceful countries in the region and a wonderful tourist destination. Tourism is their primary source of income followed by marine products, citrus, sugarcane, wood and bananas. A true adventure land; there is so much to do and explore in Belize. When my husband and I visited Belize we had the good fortune of meeting a man named Eloy who was one of the top conservationists in the country. 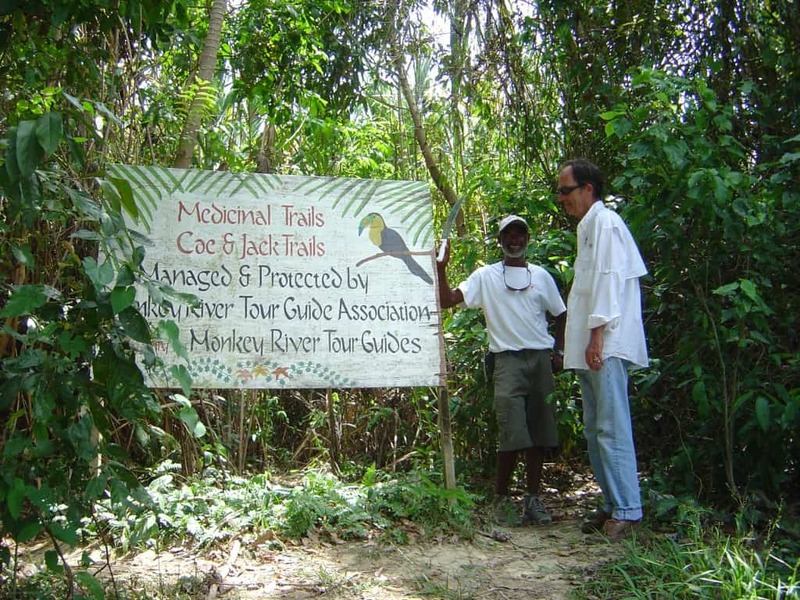 He became our guide for many amazing excursions; we fished, we snorkeled near an uninhabited island, we toured the Monkey River and we discovered the medicinal jungle trail that surrounds it. We learned all about the flora and fauna and the distinctive ecosystems that thrive here, and the extreme biodiversity. He told us that the trumpet leaf is used to lower blood pressure and heal burns and internal infections. The Cirus palm is used to make the thatched roofs or palapas and the Ora Gumby tree was ideal for the making of canoes (termites don’t like this wood.) The wildlife here was spectacular. We saw, dolphin, spotted stingray, bats, manatee, fresh water turtles, howler monkeys, crocodiles, a crocodile nest, a huge termite mound, egrets, cormorants, white, blue and tiger herons, frigates (with their red, inflated balloon like chests.) a mangrove swallow, an Oris Penudula (a bird with a hanging nest) and the kingfisher. It is truly a nature lover’s paradise. Our best time with Eloy was when he graciously invited us into his home. His wife was excited to make lunch for us, with the fish we had caught that day. They welcomed us in and asked us to take a seat at their dinner table. They poured us each a glass of their local brew called Belikin; During our visit, Eloy told stories about his beloved country. One story he told us was that Belizeans avoid swimming in the ocean or in rivers on Good Friday as it is believed to be bad luck. Local mothers tell their children they will “turn into fish” if they swim on that day. (I remember hoping that all the children listened as we were about to eat fish.) In fact, our meal was amazing; simply and perfectly grilled barracuda filet (lightly seasoned,) served with rice, beans and homemade tortillas. We learned so much about Belize in this brief encounter. There is no substitute for dining with locals and feeling the love, local knowledge and hospitality that are so freely given. As you can imagine, the cuisine in Belize is as diverse as her people, influenced by all of them. 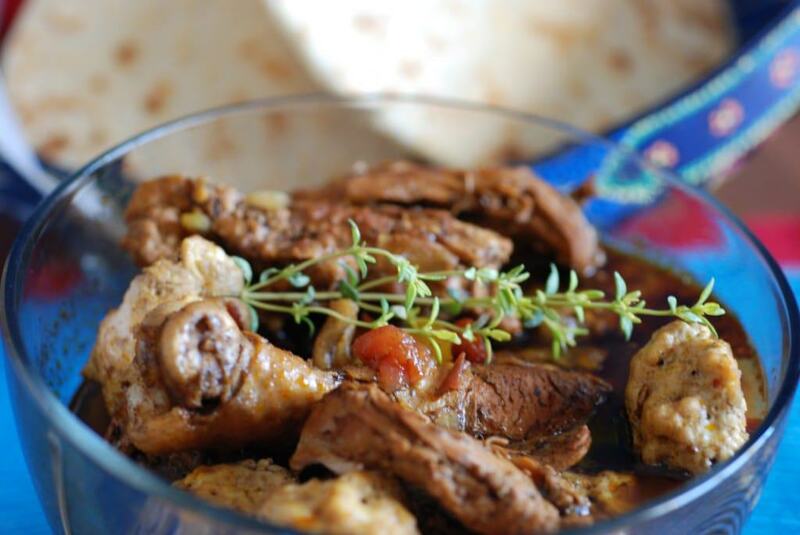 As I look to our International Cuisine meal for Belize, I was given a special recipe by a dear friend who spends quite a bit of time, each year, in Belize. 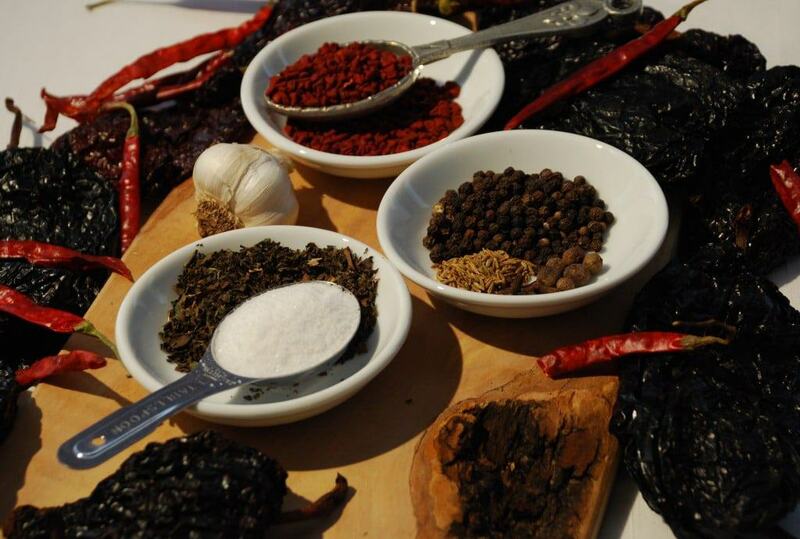 This recipe was of Mayan origin, as it calls for a spice blend called black recado. She offered to send me this spice blend that she purchases while there, but I was able to find an authentic recipe for it. Fair warning: the practice of roasting the chilies has been banned in some regions as it causes quite a bit of smoke and burning to the eyes. Please, if you attempt to make the recado, roast the chilies outside. You can also find the spice online, if you don’t want to risk it. 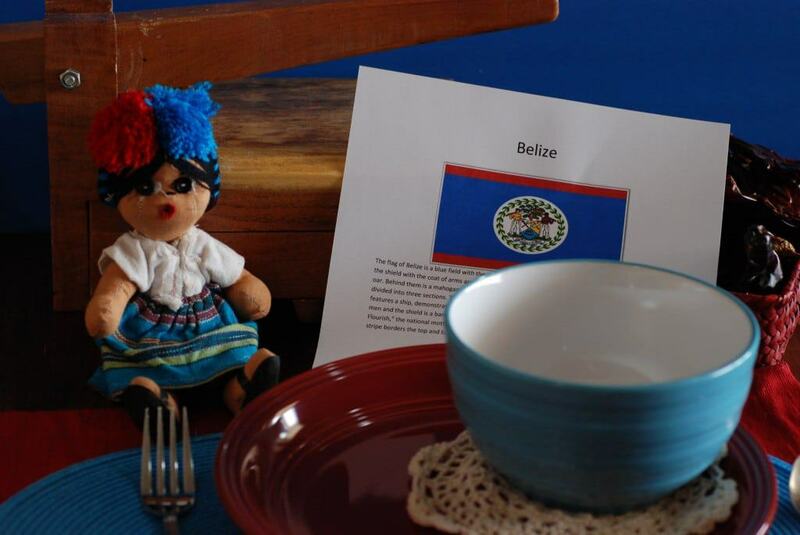 For the meal, we set the table using the colors of the Belize flag; blue and red. We used little Mayan dolls and baskets as our centerpiece, (purchased on our visit there) along with a tortilla press, used to make the plantain chips and homemade tortillas. 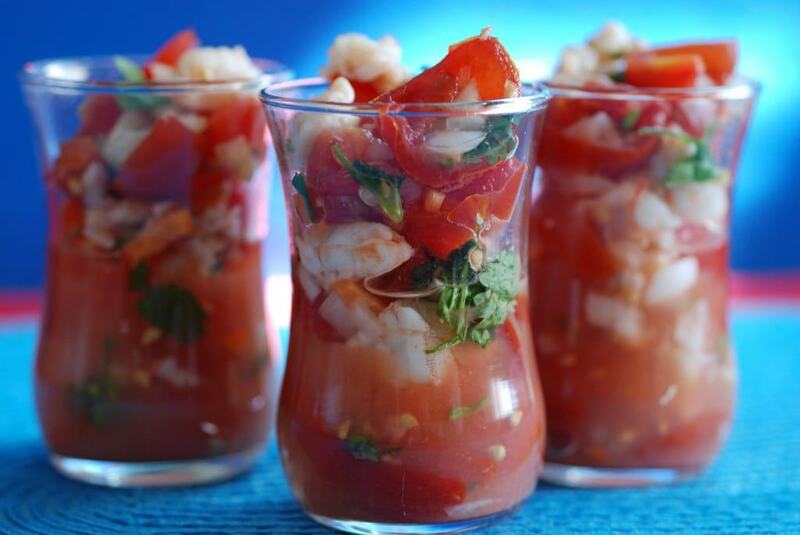 We began with the shrimp ceviche. I used raw shrimp and let the lime juice cook the shrimp and blend with the other ingredients. We served it on a homemade plantain chip. The integration of the flavors was superb. The main dish, called chimole, was excellent. The black recado seasoning added a rich, smoky flavor, like nothing I have ever experienced. The chicken was ever so tender and oh my, the pork meatballs; excellent! Of course, this was served with homemade flour tortillas. 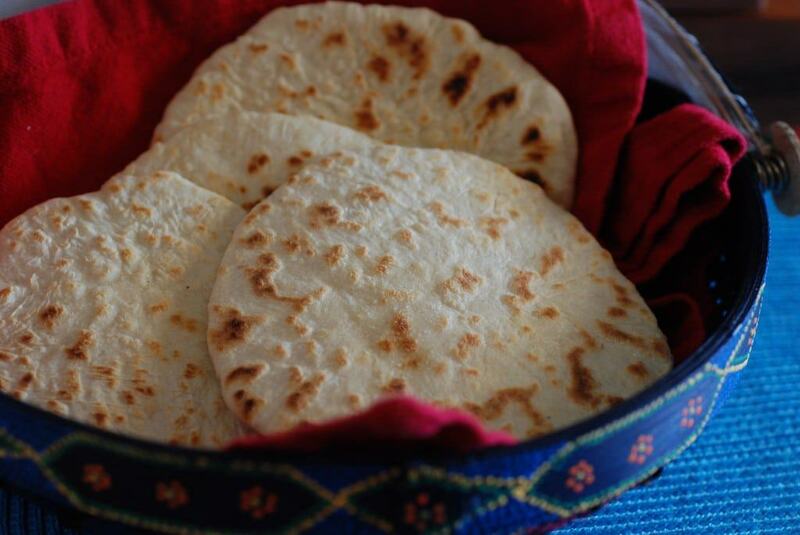 I used coconut milk for the liquid ingredient in the tortillas and the taste was awesome. They are a bit thicker than one would expect but perfect for dipping into the chimole. 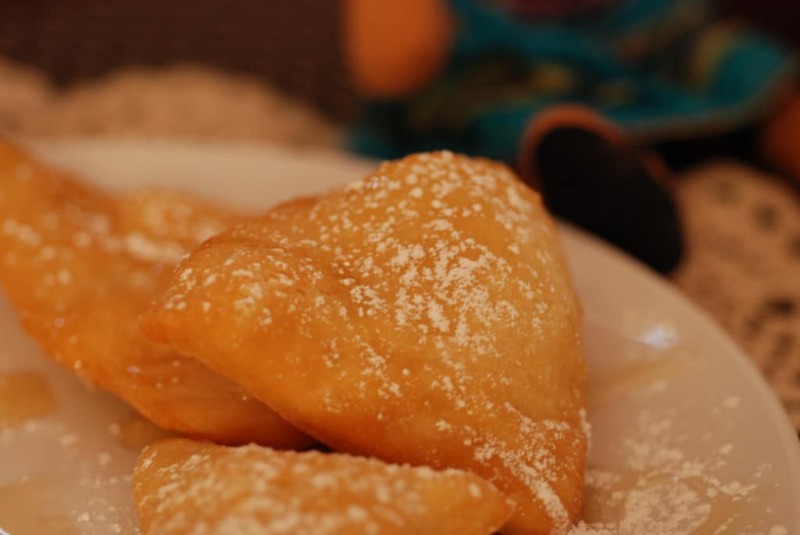 For dessert, I chose to make what some would consider to be the national dish of Belize; little fried treats, called fry Jacks. In all fairness, these are typically served for breakfast, but I could not resist; fried dough with honey, simply amazing anytime! We loved this meal and reminisced about our awesome visit there. But before we go, there is one more story I must tell. On our way to visit some Mayan ruins, we were heading down the country road in a van with our driver. Suddenly, we passed a scene on the road that provoked me to demand the driver “STOP!! !” the vehicle. A dog, whose muzzle was stuck in a bucket, was desperately struggling for air and had engaged the help of a pig. The pig was using its snout and hooves, trying to pry the bucket off the dog’s muzzle, but to no avail. The driver stopped the van and my brother-in-law, Bill, and my husband, Dan, were first on the scene. They relieved the frantic pig from its struggles and Bill, grabbed the bucket and used all his strength to pull it straight up in the air (taking the dog with it.) It was really stuck! After a few attempts, the bucket at last dislodged and the dog made a sigh like no other; one of total and complete relief! The dog and the pig, as though they were best friends, casually wandered off together, thankful to be alive. We went on our way, knowing we had done one good deed. I leave you one of Mother Nature’s gifts captured at sunrise over the Caribbean from our screened in porch on the beach. A true paradise! Loved the pics, spices and fry jack especially. Loved the personal stories and pig and dog were cute. Thanks Steve, the pig and the dog is a scene I will never forget, glad you enjoyed it! I just wanted you to know how much I’ve been enjoying your website and look forward to it every Thursday! It’s been very interesting to learn about a different country each week that I normally would not take the time to explore. Makes me realize what I’m missing. 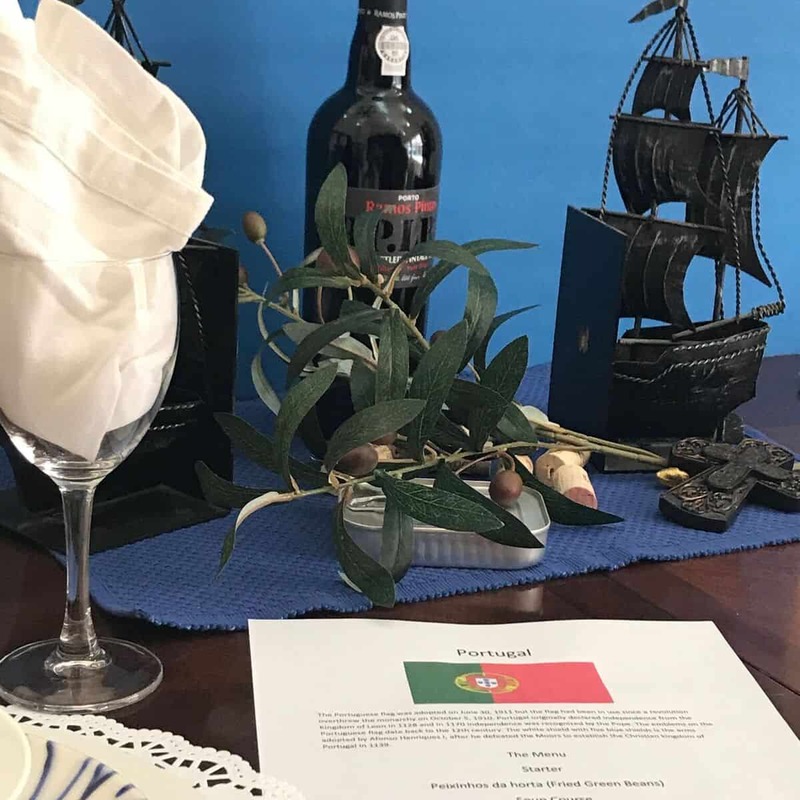 The featured dishes for each country look delicious! I’m keeping a copy of each menu and its recipes to refer to later, as I need them. Thank you for sending them to me, and please keep them coming! Thank you so much Betsy, it means the world to me!